Prone to being somewhat melodramatic and hyperbolic (yes, I know I don’t have three feet! ), I decided I’d peaked out too early. After all, Lear was an old man when he cast himself out and then had to grapple with what it feels like not to have a home or identity, whereas I was still a young woman. It’s a good thing I was never a Third Culture Kid, or TCK—that’s all I can say, or else we’d be in for some MAJOR drama on this site. Instead we can leave that to someone much more suited: the actress Elizabeth Liang, who is the subject of today’s post. A self-described Guatemalan-American business brat of Chinese-Spanish-Irish-French-German-English descent, Liang was brought up by peripatetic parents in Central America, North Africa, the Middle East, and Connecticut. Having faced the existential question of “Who are you when you’re from everywhere and nowhere?” practically from the moment of birth, Liang has channeled her thoughts into the creation of a one-woman show, Alien Citizen, which will have its world premiere in Los Angeles with performances this coming Friday and Saturday, May 3-4 (closing June 1). It’s being presented by Liang’s own company, HapaLis Productions, in association with the Multiracial Americans of Southern California. 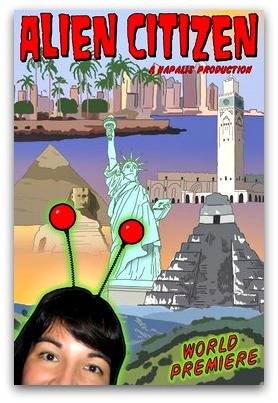 It weaves humorous stories about growing up as an Alien Citizen abroad with American commercial jingles providing [Elizabeth’s] soundtrack through first love, language confusion, culture shock, Clark Gable, and sandstorms. I wrote Alien Citizen for my fellow global nomads and TCKs, because we rarely see our stories portrayed on stage or screen. I also wrote it because I kept being asked if I was from the Midwestern USA and I wanted to set the record straight: my story is unusual, and, I hope, interesting. The play is about identity, which everyone grapples with, but I especially hope that everyone who has lived a cross-cultural life—anyone who has felt like a bridge or an island or both—will relate to it. Show our TCK performer some love! Readers, it’s time we showed Elizabeth some love for what she’s up to this month. If you live in the LA area, get your ticket half price through May 25th and after that at regular price. subscribe to her podcast series, Hapa Happy Hour, which explores and celebrates the mixed-heritage experience. I may be a Third Culture Kid, but bring me the (gluten-free) figgy pudding!